Throughout all that there were legitimately up to 50 players who put in performances deserving consideration for the Team of the Week, but it's been narrowed down to 22 including a familiar face as Player of the Round. Kyal Horsley might no longer be captain at Subiaco, but he is showing no signs of slowing down following a dominant display for the Lions in their big win over East Perth in Round 1. Horsley surrendered the captaincy in 2019 to Leigh Kitchin after a remarkable stint as skipper at the Lions since returning from his stint in the AFL with the Gold Coast Suns. Horsley returned in 2014 and was premiership captain immediately that season and went on to lead Subiaco to Grand Final appearances in 2015, 2016, 2017 and 2018 as well for premierships in 2015 and 2018. He was still playing outstanding football in 2018 and might have been considered unlucky by many to miss out on winning the Sandover Medal given it was likely the best and most successful of his remarkable career. But in the end what he walked away from the year with established his legacy further with the fourth premierships and Simpson Medal. Horsley is now a three-time fairest and best winner with Subiaco on top of being a life member at the Lions with 183 games under his belt while also having played four times for the WAFL State Team as well as being captain of his state. And there is no signs to suggest he is about to slow down based on his performance in the 79-point win for Subiaco over their Leederville Oval co-tenants East Perth. Horsley was a dominant presence through the middle of the ground finishing the afternoon with 36 possessions, seven marks and five entries inside the forward 50. Captain or not, with Horsley playing in that type of form will continue to mean Subiaco is the team to beat in the WAFL. Having spent more of his career at this point as a half-forward or occasional wingman who would float in and out of games, with moments of brilliance and long periods of going missing, he might have found his position in defence. He looked right at home being a creator coming out of the back-line for Swan Districts in Round 1 and finished with 18 possessions, 11 marks and a classy goal. In such a star-studded Subiaco side he doesn’t always receive all the attention as he doesn’t amass the big numbers or kick the goals as others, but he is every bit as important to the Lions success as anyone. And he was tremendous as a key defender once more on Saturday to start the new season against East Perth finishing with 14 possessions, four marks, four tackles and a rare goal. He solidified his place as likely the best small defender in the competition in the back half of 2018 and started 2019 tremendously while given the big task of trying to nullify the influence of Swan Districts recruit George Hampson. He did well limiting Hampson to 14 touches and two behinds while having nine disposals, three marks and three tackles himself. He found his feet as a defender at Claremont over the past couple of years but is also having a significant impact further up the ground and as a big-bodied wingman as well. He began the 2019 season in some brilliant form despite an injury-interrupted pre-season and had 28 possessions, seven marks, six tackles, five inside-50 entries and two goals in Saturday's big win over East Fremantle. 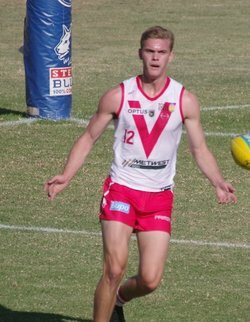 Cemented his place in South Fremantle team down back last season after making his debut late in 2017 and now looks ready to become one of the standout mid-size defenders in the WAFL this season. Had a remarkable start on Saturday against Swan Districts with 13 first-quarter possessions and ended the game with 26 to go with seven marks. 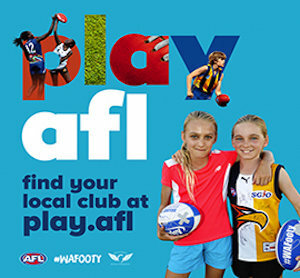 He was a premiership player in 2018 and looks set to take his game to the next level in 2019 based on his showing on Saturday in Subiaco's big win over East Perth. Capable of playing down back, through the middle and on the wing, his versatility is a great asset for the Lions and he showed a tremendous display with 29 possessions, eight marks, four tackles and two goals. He is now well and truly settled into life at Swan Districts, has taken on his old No. 2 that he wore with such distinction at East Perth, and he likely played his best game in black-and-white in the narrow loss to South Fremantle. Finished the game with 25 possessions, seven marks and two goals, including the goal that brought Swans back within a kick with time running out. The reigning Simpson and Sandover Medallist shook off the disappointment of not finding his way onto an AFL list in 2019 by starting off his new season at Claremont in the same form that saw him have such a standout 2018. He led the way for a big Tigers win over the Sharks with 35 possessions, 10 marks, six inside 50s, four tackles and a goal. 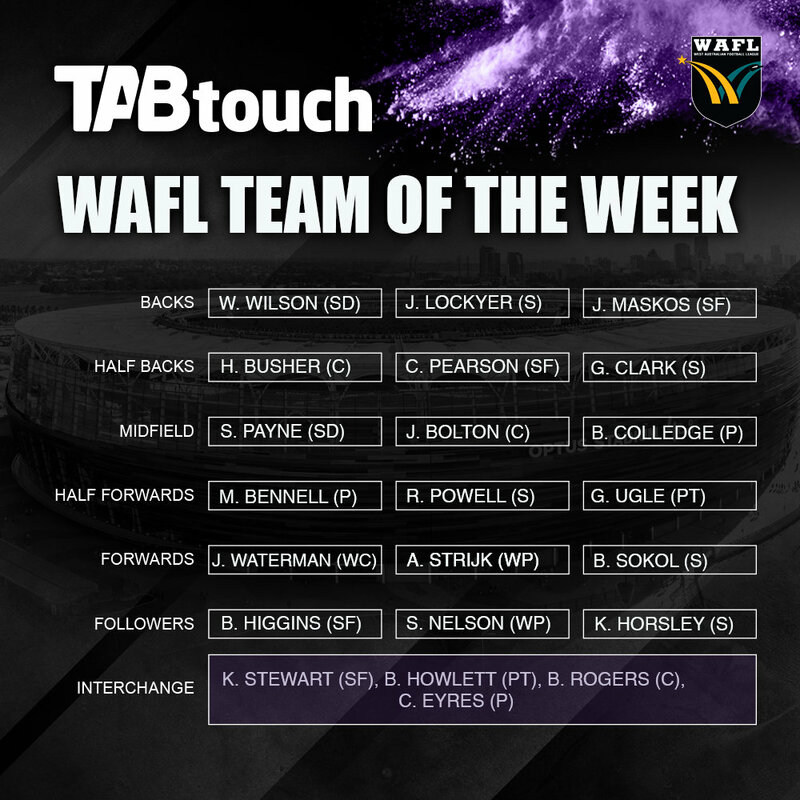 The reigning Perth fairest and best winner who was named in the 2018 WAFL Team of the Year started 2019 right where he left off in Saturday's win for the Demons over the West Coast Eagles. With his body continuing to hold up, he continued to spend most of the time through the middle and ended the game with 25 possessions, 10 tackles and seven marks. He burst onto the scene from nowhere midway through last year showing he had a remarkable goal sense on top of tremendous pace and a big leap. He showed on Saturday in the win over West Coast he's ready to put that together for a whole season now kicking four goals for the Demons from seven kicks while also doing well applying pressure by putting on seven strong tackles. He was a bit of a luxury last year in Subiaco's premiership team with the skill set he has as someone with good size and mobility who is a tremendous mark and also good at ground level. But he could make himself an invaluable member of the side this year based on his showing on Saturday made up of 19 disposals, four marks and two goals. He might no longer be captain at Peel in 2019 but he started the new season in impressive form as a lively small forward on a team that continues to try to find avenues to goal with most other areas covered well. He ended up kicking four goals from 11 possessions and four marks in Saturday's season-opening home victory against West Perth. Desperate to make a strong case to get back into the West Coast AFL forward-line where he started the season, he couldn’t have been more impressive in the Eagles' debut in the WAFL despite the loss to Perth. He kicked five goals for the day from 11 kicks and eight marks. He'll also go down in history kicking the Eagles' first ever goal as a standalone club in the WAFL. Having spent his career rotating between half-forward and half-back, he settled into playing out of the forward goal square with remarkable results, going on share the Bernie Naylor Medal with teammate Tyler Keitel. Keitel wasn’t there on Saturday against Peel serving his suspension from the Grand Final, but he stood up once more with four goals from 17 possessions and six marks in a fascinating battle from Dockers rookie Tobe Watson. Was Subiaco's leading goalkicker last year in a premiership season so it was a tremendous 2018 and he looks set to continue that career-best form in 2019. Had a big say in Subiaco's thumping of East Perth in Round 1 ending up booting five goals to go with 10 kicks, five marks and five tackles. Had a big job to start the new season tackling Swan Districts pair Corey Gault and Nathan Blakely, but he clearly asserted himself as the best big man on the ground in a tireless performance. Put together a tremendous performance made up of 23 possessions, 39 hit outs and five tackles and much of the Bulldogs' prospects in 2019 could again rely on him staying healthy. Coming off a remarkably consistent huge ball-winning season in 2018, he picked up exactly where he left off for the Falcons on Saturday in Mandurah against Peel. He just about lived up to his averages of 2018, which is remarkable and finished the game with 36 possessions, 10 entries inside-50, six marks, six tackles and a goal. With the amount of talent and experience South Fremantle lost in the off-season, he was one coming in the other direction and put in a best on ground display in his first WAFL game for the Bulldogs since before he was drafted to Hawthorn back in 2015. Both when in the midfield and resting forward, he had a significant impact with 28 disposals, eight marks, seven tackles and the first goal of the last quarter. He won the Peel fairest and best last year on return home from his time at Essendon and has been appointed captain for 2019, and showed why with a tremendous leadership performance on Saturday's win over West Perth. Ended up with good numbers too made up of 27 possessions, 11 tackles, four inside 50s and three marks. 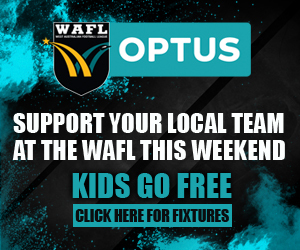 Continues to emerge as one of the best half-back flankers in the WAFL and building on the momentum he was able to build in being part of Claremont's finals push last season, he began 2019 impressive as the Tigers thumped the Sharks. He ended the afternoon at Claremont Oval with 18 disposals, four marks and four tackles. The workhorse Perth ruckman did appear to have his hands full going up against West Coast's Keegan Brooksby, Patrick Bines and Fraser McInnes on Saturday, but he did a tremendous job to clearly be the most influential ruckman in the contest. He finished the afternoon with 17 possessions, 23 hit outs, five tackles and four marks. Perth's Michael Sinclair, Clint Jones, Shaun Smith and Brent Edmonds. West Coast Eagles captain Fraser McInnes. Peel Thunder's Mitch Crowden, Tom North, Jackson Merrett, Stefan Giro, James Sturrock, Lloyd Meek and Ben Hancock. West Perth's Blake Wilhelm, Aaron Black, Rudy Riddoch, Trent Manzone, Mitch Peirce and Laine Rasmussen. Subiaco's Josh Deluca, Leigh Kitchin, Lachlan Delahunty, Hayden Kennedy, Craig Hoskins, Michael Braut and Jack Beverley. East Perth's Rohan Kerr, Jackson Ramsay, Angus Scott, Sharrod Wellingham, Nathan Blee and Jordan Busher. Claremont's Kane Mitchell, Ryan Lim, Lachlan Martinis, Tyron Smallwood, Matthew Palfrey and Tom Lee. East Fremantle's Cameron Eardley, Jordan Snadden and Jonathon Griffin. Swan Districts' Jesse Glass-McCasker, Jesse Turner and Josh Cipro. South Fremantle's Brandon Donaldson, Haiden Schloithe, Jacob Dragovich, Nick Suban, Caleb Datson and Zac Dent.